Discussion in 'Colored Gemstones' started by rosemarygumdrops, Nov 22, 2018. So this is an alexandrite my Mom bought shortly before she died. I am home for Thanksgiving and found it. I think I want a ring a ring for my right hand middle finger. Serving suggestions? MrsKMB, strawrose and Keeliamira like this. I think it would look lovely with a diamond halo, or maybe a floral diamond halo. How special that you found one of her last purchased treasures, and now the love of that gemstone can flow from her to you. I personally would set it with a simple band and a miligrained bezel in 14k rose gold. I would leave it alone, or maybe engrave it on the inside with something sentimental, and wear it to remember her. rockhoundofficiando, Arkteia, strawrose and 1 other person like this. Normally I would be on team "as is" but the silver is giving me hives. I am starting to lean towards setting it a super 3d forget me not in rose gold. Aw I love that idea! I also love that 3D sculpted look. I’m considering a setting like these for the opal I recently ordered. rockhoundofficiando and strawrose like this. I'm sorry but I'm not sure what you mean by this sentence, grammatical error? "I am starting to lean towards setting it a super 3d forget me not in rose gold." Sorry. I mean the forget me not the flower. I want to see if I can get a 3d setting where the flower really looks like a flower and the petals are substantial. I am not sure if that is logical. voce, strawrose and TheGarnetGirl like this. For some reason that sentence read so weird but I see what youre trying to say now! 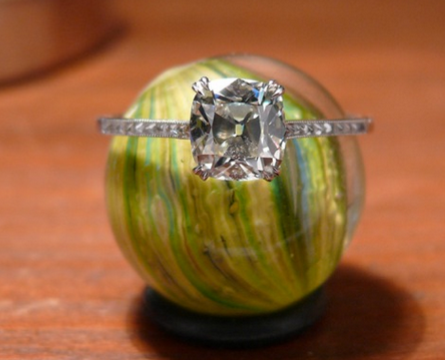 Because the stone has sentimental value I say design your dream setting. A floral setting would be beautiful! And alexandrites look oh so yummy in rose gold! Theyre made for that gold but dont make it look overly trendy. I was at the train station and did not proof read! I want to go all out and get something she would love. Part of me is thinking of having the alexandrite in a paraiba halo within the flower but I am not sure if that is overkill or amazing. Ideas? Maybe like Mary Kate Olson's ring but with five petals. I am not sure how I feel about this. I am not supre happy with it. What do you all think? If you're not happy then I think you definitely shouldnt settle, this piece is going to be special and something which you will treasure forever. Also it doesnt look like your inspiration at all, youre inspiration is stylized, perhaps with some floral inspiration. You're cad looks like they took you literally when you said flower. Also the upturned petals would drive me crazy, I'd constantly be catching them on everything. But that is probaby just me. Eh. It’s a little too literal for me I think. I second the suggestion of looking at MC2. Greenlake also does some lovely flower inspired designs. rosemarygumdrops and lovedogs like this. Hmm. Not what you were describing at all. Don't get frustrated. This is a process that will take a little time and patience. MrsKMB and qubitasaurus like this. Thank you so much for the suggestion. THIS is exactly what I want and I did not even know it. Do you think it would translate well to an oval? qubitasaurus and lovedogs like this. I think claw prongs are a great idea. Gorgeous! I think it could be an oval. I think it would look great in an oval. A word of caution - this design is very intricate, lots of layers of brushed gold petals with tiny diamonds tucked in - make sure that your jeweler has the experience to do this type of ring. Some do and some don't. junebug17, qubitasaurus and lovedogs like this. I would try to pick out what you like about the ring -- is it the lack of uniformity of the petals? the number of layers? the (what looks like 24 kt gold finish) brushed petals? the spacing of the daimonds and prongs? And then see if your jewler will sit with you and sketch something out which they feel would be a good adaptation and also matches their style (different jewlers different strengths). I think I really love the prongs and the texture of the leaves as well as the small diamonds. I think those elements could be worked in a dive petal ring. Well here is the updated cad. I still want it more 3-d and with more prongs. Thoughts? How about adding slightly smaller layered petals between the large petals, at the prongs? I think six prongs are plenty. It's already pretty curved/angled, so lower the angle of the current petals a bit more so that more petals can be added. Then the tops of all petals will be even with the stone. Did you ever finish the lovely sentimental ring? Id love to see if you wouldnt mind sharing! He fluffed up the petals more and I really like it now. He is going to make the petals mat. I have to say I am not thrilled with his communication. chrono, Acinom, 2Neezers and 1 other person like this. Aww, I'm sorry that hes lacking in the communication department. Try not to let that aspect taint the overall feeling of the piece as I've had it happen and its not fun. As for the setting, i think its beautiful and will do justice to your mothers stone. Congratulations and I hope you post pictures of the finished piece soon! Thank you! I am excited to see what it looks like with the brushed petals. Is this a David Class project? Looking forward to seeing the ring! It is! It is my first time working with him.